Since 1990, Saint Clair Systems has supplied more than 3,600 temperature control systems to coil coaters and manufacturers around the world. Our engineering team provides cost-effective solutions to manufacturers who understand that quality and productivity are too important to leave to uncontrolled variables. 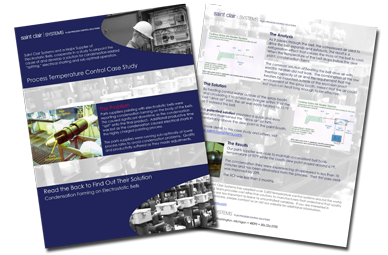 Download our In-Booth Temperature Control Case Study to learn more about how we can troubleshoot issues like condensation and electrical shorting to ensure quality and productivity in your coating process.